Science-based aromatherapy & essential oils for acne & problem skin. 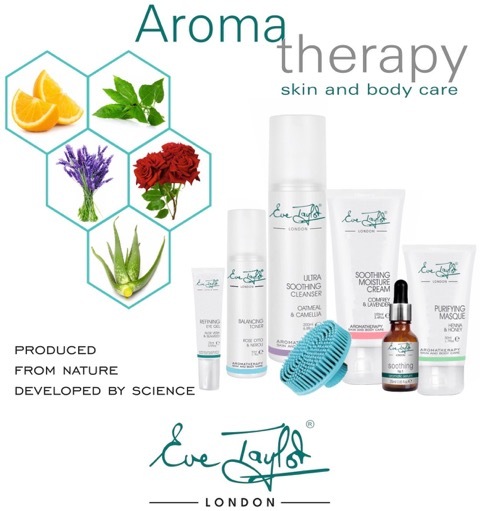 Eve Taylor of Britain has been helping acne clients from the world with naturally blended essential oils. Her clean & natural approach to aromatherapy skin care distinguishes her from rest – proudly standing behind her products for over 50 years. Sourced from carefully inspected growers, EveTaylor® is paraben free. What is especially unique is that the entire line is produced in small batches to ensure active ingredients retain their freshness and potency. All essential oils are gathered by hand and are put through an extraction process within hours of the harvest. These strict regulations maximum potency & therapeutic effect with the best possible results for your skin. EveTaylor Essentials offer superior quality at a fair price. Contains pure ingredients – no added fillers. Grown and harvested with strict guidelines and standards. How can aromatherapy and essential oils help with acne? Aromatherapy and the practical use of essential oils can help resolve the challenges of treating Acne. Apart from smelling pleasant and giving sensory gratification, essential oils also have the ability to restore balance, kill bacteria and calm inflammation. Contrary to popular belief, “Oil controls oil”. EveTaylor Acne Clearing Serum (Aromatic #3) will help your acne in terms of bacterial control. Used as a potent home treatment serum, this unique “oil blend” will help to reduce over active sebaceous glands and P.Acnes bacteria. It is the ability of EveTaylor® essentials to also balance hydration that make them a favorite for those suffering from acne. While single oils can be effective on their own, EveTaylor features “blended formulations” whose combined properties offer exponentially more potent and powerful outcomes than the the sum of the single ingredients. Book your EveTaylor Acne Facial or Product Consultation Today.